In Ayurveda, the ancient system of life, the year is divided into six seasons. One of the tenets of Ayurveda is to eat according to seasons which is known to keep the body and our health in balance and harmony. Learn all about seasonal eating with a focus on the winter season (shishir ritu) in the Divine Taste Workshop by Anushruti in Malad West, Mumbai. 8th December 4-7pm. In winter season or the shishir ritu, agni or the fire component in our bodies is the strongest and certain foods are recommended to keep the digestive fire going. Being largely predominated by Vata dosha, warm and nourishing foods are to eaten in this season. 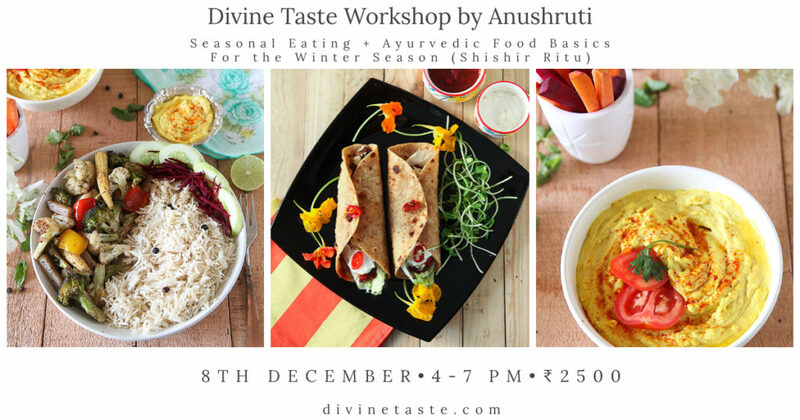 This is a demo style workshop with basic theory about Ayurvedic seasonal cooking. Notes of the concepts and recipes will be provided. A rejuvenating warm drink with healing spices that can be had throughout the year with little twists for the winter season. The antioxidant properties of turmeric and its beautiful hue give this popular Mediterranean dish an extra dimension of taste apart from infusing it with its nourishing properties. The exotic sumac and other spices infuse winter vegetables with all their aromatic properties. The antibacterial properties of pepper make it a useful spice for winter. The beautiful flavours of black pepper permeate this rice, also a personal favourite. Comprising of whole wheat tortillas, refried beans and other toppings, burritos are fun to make and to eat. This dreamy and comforting dessert made with heirloom wheat grain is sure to delight and comfort your senses. All recipes are based on the sattvic principles of Ayurvedic cooking.